On the 9th of February 2013 our lives changed forever. We found out that we were expecting our first child. Unfortunately our excitement and happiness was shattered at our routine 20 week scan in Altnagelvin Hospital. The sonographer said that she was unable to see all four chambers of our baby’s heart. We were distraught. The consultant came to see us and explained that we would have to go to Royal Jubilee Maternity Hospital in Belfast to have an echo carried out by a foetal Cardiologist. I will never forget the consultant’s words. ‘This will be like a stone in your shoe’ he said, ‘Until you get your appointment’. We waited four weeks for that foetal cardiology appointment. The longest four weeks of our lives. On the 31st of May Dr Sands carried out the foetal echo and sadly he said that our baby had a severe heart problem. We don’t remember very much after that, but remember with great affection the manner in which Dr Sands and Edith Crawford, the Ante Natal Liaison Nurse, cared for us. Dr Sands decided that it was best that the baby be induced at Royal Jubilee Maternity hospital as close to baby’s due date as possible. Regrettably despite two days and two different methods of induction the baby had to be born via caesarean section at 39 weeks. Our beautiful black haired daughter Rosa Christina made her way into the world at 7pm on Tuesday 17th September. She was 8lb 8oz. Rosa was taken straight to the Neo Natal Unit. We didn’t get to hold her. At around midnight Dr Grant came to visit us on the maternity ward. He explained that Rosa’s heart condition was more serious than expected and that she would be travelling via air ambulance to Birmingham Children’s hospital the next day for open heart surgery. Soon we realised that we wouldn’t all be able to go. Daddy and Rosa would go to Birmingham but I would have to remain in Belfast until I had recovered from my own surgery. 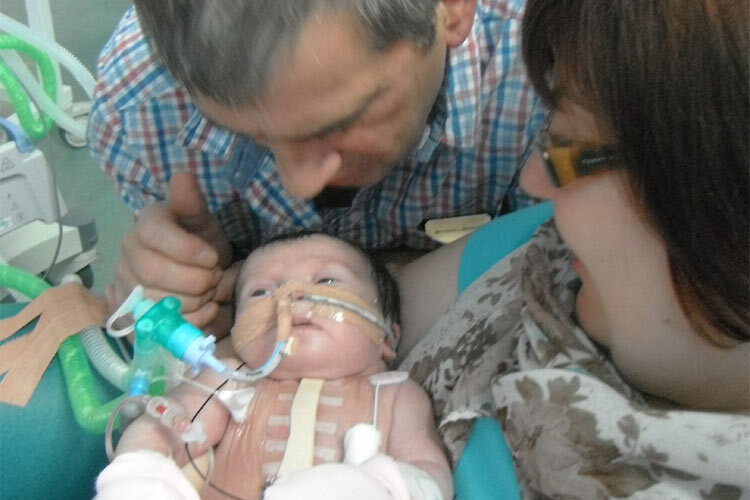 On Friday 20th September, barely 3 days old, Rosa underwent her first open heart surgery, the Norwood. Daddy carried her down to theatre. While Rosa was in surgery I was on a flight from Belfast to Birmingham. I wasn’t waiting another day; I had to be with our girl! When I finally got to see our baby she was on intensive care hooked up to multiple machines and had a dressing on her chest which read ‘chest open’. It was surreal. I didn’t feel like it was happening to us. At 10days old the day that I longed for happened; I was able to hold my daughter for the first time. She was still on the ventilator but I didn’t mind. 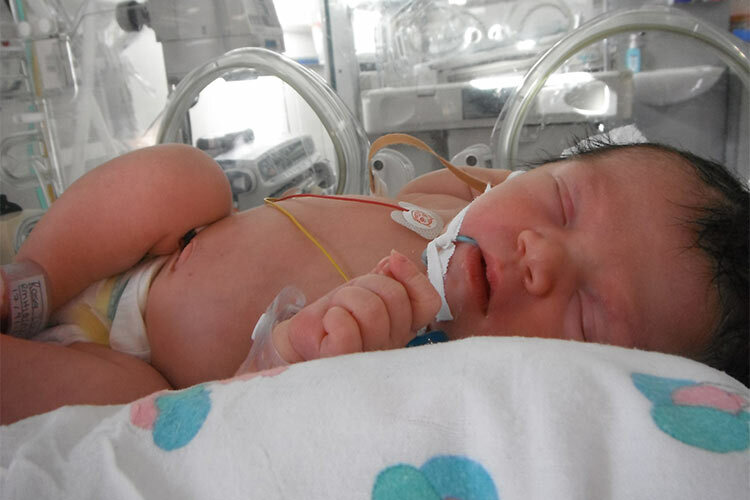 Rosa was ventilated for 11 days and we were so relieved when the ventilator was removed. 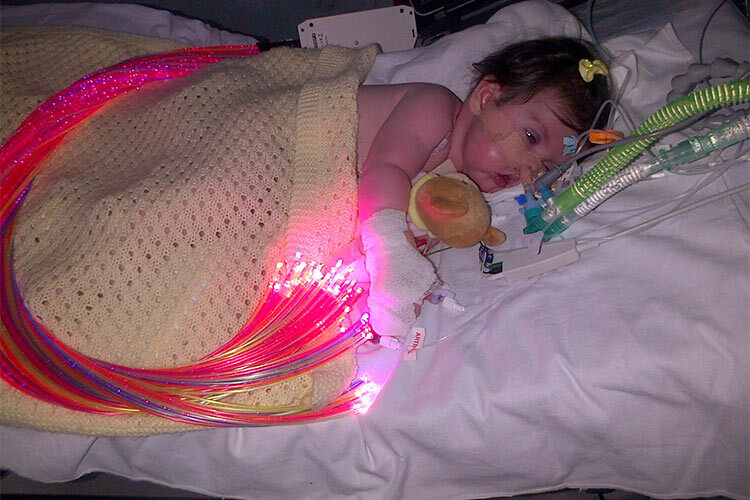 But not long after she was diagnosed with Ecoli sepsis of the blood and urine. Rosa fought really hard. Finally after four and a half weeks on intensive care we were moved to HDU on the ward. Slowly but surely we were getting there. We returned to Clark Clinic after six weeks in Birmingham. This was when we first met Sarah and introduced to the marvellous work of The Children’s Heartbeat Trust. We spent five and a half weeks on Clark before finally returning home when Rosa was three months old. Rosa was NG fed and remained quite stable at home. We were in regular contact with Rosie and Catherine via our home video link. This was a God send. In April 2014 at seven months old Rosa returned to Birmingham via Air Ambulance for her second open heart surgery The Glenn. The surgeon met with us and explained that the surgery would take around 5 hours. I was brave and carried Rosa down this time. But as we have come to learn with Rosa things are never straight forward. Rosa had her surgery as planned but afterwards while still in theatre her saturation levels dropped to below 50. Rosa had to go back onto the bypass machine. Rosa was in surgery for a total of nine and a half hours. It was the longest day of our lives. When she came back onto Intensive Care her saturations had not improved despite a right lung angioplasty and her blood pressure was very high. The next 24 hours were crucial. Thankfully after 3 days Rosa began to improve much to the delight of the surgical team and ourselves. She was discharged two weeks after surgery. We had a quick pit stop at the Children’s hospital where Dr Mc Crossan examined Rosa and allowed us to continue on our journey home. Since that day Rosa hasn’t looked back – she even had her feeding tube removed at 15 months. 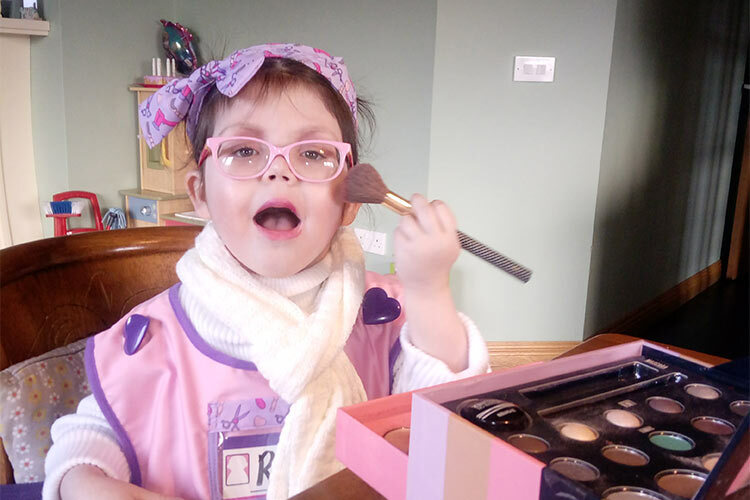 Despite having numerous other medical and mobility problems in addition to her congenital heart defects Rosa is now enjoying nursery school and is our social butterfly. Rosa sees Dr Grant every 6 months now. She has numerous heart defects including mitral atresia, Hypoplastic left ventricle, double outlet right ventricle and moderate- severe Aortic arch hypoplasia. When we describe Rosa’s CHD usually use the umbrella term Hypoplastic Left Heart Syndrome. Our family motto is half a heart not half a life. Every day is precious with our princess. Children’s Heartbeat Trust have recently started a heart family group in Omagh and I am proud to be one of the local group organisers for the Omagh Group. The group is a great opportunity to meet other local heart families whilst taking part in local fun days and activities along the way!  All heart families are welcome to join us and as it’s a new group, we are all newbies! Contact me on: 077 9539 2666 if you would like to come along.